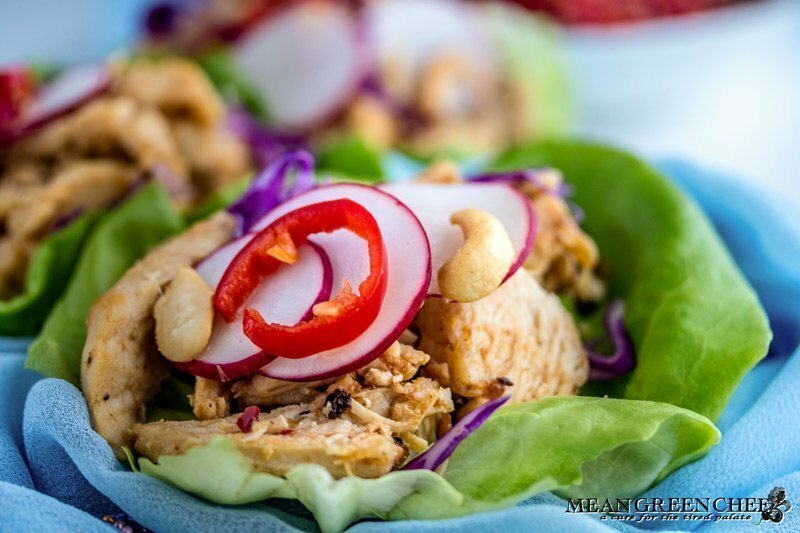 Spice things up a little with our Thai Chicken Lettuce Wraps! Original Thai essence wrapped in organic butter lettuce that was hydroponically raised. Then topped off with cashews, thinly sliced veg and a spicy Thai sauce called prik nam pla for an amazing pop of flavor! A great option for a healthy fast dinner any night of the week! The marinade is made quickly by blitzing the ingredients in a food processor, safely marinate the chicken up to 2 days prior to cooking. This really infuses a ton of Thai flavor to an otherwise boring chicken breast. What is prik nam pla? Add a little drizzle of this sauce and a couple of peppers and it’s literally a flavor explosion, that takes each bite to the next level! Found on tables all over Thailand and used much the same way we use salt and pepper. Prik nam pla (chilies and fish sauce พริกน้ำปลา): It’s so simple and so good! Slice or dice up about 5 Thai chilies, stir in about 3 Tablespoons of fish sauce and a heavy squeeze of lime. Mix and allow to sit while you make the rest of the meal. Although lime juice is not always an addition we find the hit of acid really enhances the taste. Where do I find fish sauce? Most supermarkets sell fish sauce in the Asian section, most likely near the soy sauce selections. Of course, you’ll also find it in Asian, Thai and Vietnamese markets too. Note: Obviously if you or anyone in your family has a fish allergy then steer clear of the fish sauce. And top with a fresh squeeze of lime. What type of lettuce can I use for wraps? The best lettuce for these Thai chicken wraps is butter or bibb lettuce. We use a hydroponically grown organic butter lettuce (as pictured) it’s not only the perfect size but also has the right bite that compliments the chicken. In a pinch, you could opt for romaine lettuce but it becomes more of a boat at that point. Spice things up a little with our Thai Chicken Wraps! Original Thai flavor wrapped in organic butter lettuce that was hydroponically raised. Then topped off with chilies and fish sauce (prik nam pla พริกน้ำปลา). Additional veg of choice: purple cabbage, carrots, red peppers, etc. Add garlic, lime zest, lime juice, cilantro, lemongrass, Thai chili paste, sweet chili sauce, and EVOO to a food processor and blitz for 30 seconds. Pour marinade over chicken, being sure that the chicken is thoroughly coated. Cover tightly with plastic wrap and refrigerate at least 4 hours and up to 2 days. Mix the sliced chilies, fish sauce, and juice of a half of a lime. Wrap tightly and refrigerate at least 4 hours. Heat a large heavy-bottomed pan or Dutch oven over medium-high heat. Once hot, add a good splash of EVOO and reheat 30 seconds. Add the chicken and brown each side (5 minutes each side). Cover and cook an additional 5 minutes. Remove from heat and shred chicken with 2 forks. Add the chicken back to the pan and stir to cover with pan jus. Add about a half of cup of chicken to freshly washed butter lettuce. Then top with your choice of fresh chopped veg and drizzle of fish sauce. Marinate for at least 4 hours and up to 48 hours tightly wrapped in the fridge. Store leftovers tightly wrapped up to 2 days in the fridge. Looking for other fresh and spicy dishes? Then be sure to have a look at some of our other recipe ideas! If you have a blog and want to grow it then be sure to check out our directory to 100+ Link Parties! Oh this sounds so good! This is the kind of thing I take for lunch – Thanks for sharing at the What’s for Dinner party. Have a fantastic week!